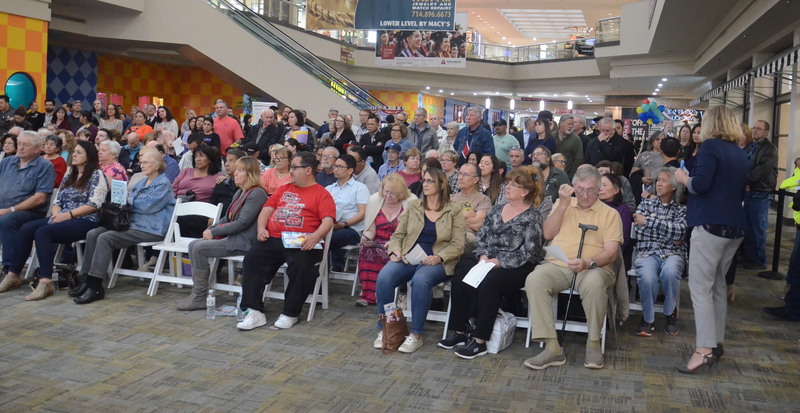 FOUR HUNDRED OR MORE people showed up for Tuesday’s open house on the future of the Westminster Mall site (Tribune photos by Jim Tortolano). Almost before it really got started, he summed it up. “I haven’t seen this many people in Westminster Mall in a while,” Chet Simmons, assistant city manager and community development director said Tuesday evening. It was at that open house outside an entrance to the closed Sears department store that Westminster city employees, consultants and residents met to consider ways to fill that shopping center again, likely in a very new fashion. WENDY NOWAK of Placeworks addressing the crowd at Westminster Mall. 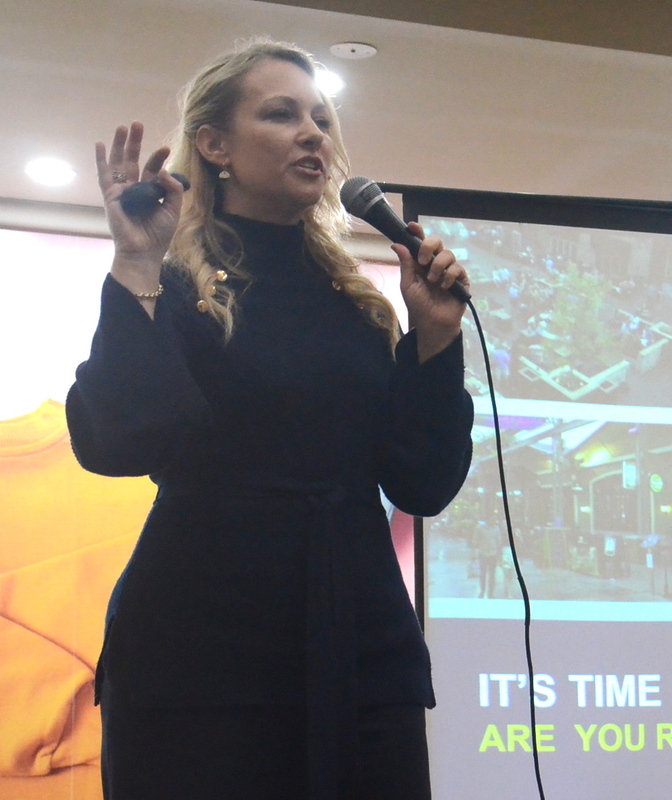 About 400 people packed an area on the lower level of the vacancy-plagued enclosed mall to hear and talk about the future of what was once Orange County’s largest. Wendy Nowak of Placeworks, which also helped prepare the city’s general plan, spoke about the changing times. “It’s not unusual for malls that were planned in the Sixties that were auto-oriented with huge parking lots to try to transition,” she said. The mall, first opened in 1974, is about 100 acres, equivalent to 75 football fields. It is about twice the size of Main Place in Santa Ana, and the property of seven owners. It’s anchored by Macy’s, JC Penney and Target department stores, but in the interior are dozens of vacant smaller storefronts. “How does Westminster [Mall] set itself apart from other projects?” she said. The city and consultant studied economic and demographic factors, including an aging population and housing stock. The general plan approved the mall area for “mixed-use” zoning as a combination of housing and retail, as well as office and hotel. As the specific plan for the mall area develops, being weighed are issues like landscaping, building heights, traffic circulation, etc. So far no such plans have been submitted by property owners, although the city wants to coordinate them all to make it into a unified project. solving transportation and circulation issues, including bicycle access and driving services such as Lyft and Uber. Although the organizers were very pleased both with the earlier survey – almost 2,000 residents responded – and the turnout Tuesday night – the missing link in terms of participation was among younger residents. The town hall throng skewed heavily toward middle age and seniors. But there will be more opportunities for input into the process. According to Nowak, the timeline for a final specific plan submitted to the planning commission and city council for approval isn’t until the spring of 2020. Why add more residents? This does not need to end up a traffic nightmare like the area of Bella Terra is. And dog park? We don’t need dogs in the mall areas more then they are now and don’t belong. These are super bad ideas!!! And no outdoor mall. We need a place to go when its summer and hot or when its cold and rainy. Freshen up what is there now. STOP PUSHING APARTMENTS WHERE THEY ARE NOT NEEDED!!!! The ones in Huntington Beach that are not full should show that this is a bad idea!!! As well as the traffic nightmares it has created!